Healthy eating doesn’t have to be complicated, and it shouldn’t be. You are more likely to stick to your healthy eating habits if the meals you are making are easy to put together, which is always what I try and aim to do with the recipes I share with you. 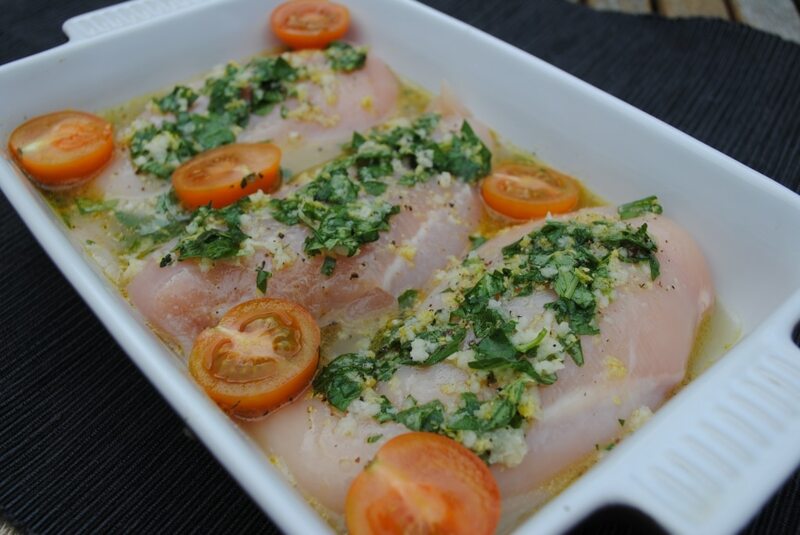 I am also trying to show you ways to liven up basic ingredients, like chicken breasts. I posted a while ago about different ways to cook with chicken breasts, and this recipe is following up from that. Let’s talk about wine shall we? You all know I enjoy a glass *ahem bottle* of wine every now and then and I especially enjoy cooking with it. I know, I know, wine lovers everywhere are thinking “but that’s a waste of wine”. But a little bit goes a long way in a dish and adds so much flavour. I have teamed up with Lindeman’s to bring you all a little sunshine through one of my recipes. Whenever the sun is shining, it makes me think of sitting outside in the garden with a cold glass of wine and this bottle of Lindeman’s Sauvignon Blanc went down very well, as you can see. I did manage to cook with some of it before we finished off the bottle. Even my non-wine drinking husband enjoyed a little glass. I am not a wine snob by any means, but that doesn’t mean that I still don’t appreciate good wine. I think Lindeman’s is really well priced, so you don’t have to break the bank to enjoy a nice glass of wine. I think this recipe just oozes summer and sunshine. It is light, fresh and zesty, with a little wine to really top off the flavour. Chicken breasts are a healthy way to get protein in to your diet, but eating them plain can get boring really quickly. Instead of covering them in bottled sauces, make your own simple sauce to add a bit of excitement to them. Most of the ingredients are likely to be ones that you already have in your kitchen, so you don’t need to buy much extra to make this. I like to serve this on top of couscous or brown rice, or sometimes just with a green salad if I am looking for a lighter meal. The sauce makes a great salad dressing. 1) Put the chicken in a baking dish and mix all the other ingredients together and pour on top of the chicken. 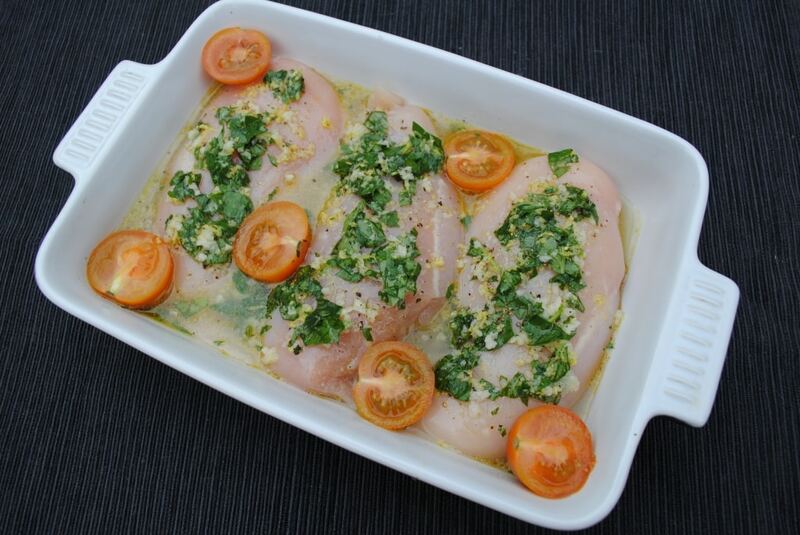 2) Bake in a preheated oven at 200C/380F for 30-40 minutes, until the chicken is cooked through. What is your favourite way to liven up chicken? Leave a comment below. This would be such a yummy summer supper eaten outside with a glass of white – I can dream! That time of year will be here before we know it. Mmm, this sounds delicious, just what I need. Going to try this this week. Thanks for the recipe! I hope you enjoy it Lucy. Is there a way to make this vegetarian? Would just roasted vegetables work well? I would say quorn or tofu would work better. I am reading this as it is raining outside and I am looking forward to warm summer evenings so I can eat something like this in the garden. It sounds wonderfully light. It’s horrible weather today, isn’t it. Bring on summer! What could I use instead of the wine? Thanks! You could use some chicken stock instead. Great recipe, especially for people that are working out! Yes, it is definitely protein packed. The lemon and basil mixture with the wine sounds like a fab combination. Will have to try a veggie version! I think it would work well with Quorn or tofu. This looks so fresh and delicious! I love meals that are so easy to put together like this one. The basil in this sounds so yummy :). I think basil might just be my favourite herb. I love cajun chicken. The spicier the better!